Stanley Chin came in contact with the world of Guitar at the age of 16. In 1997, Stanley was awarded a full scholarship by Malaysian Institute of Art (MIA) to further his studies in Classical Guitar and Composition as second study, graduating from MIA in 2000 with a Diploma in Music. His lecturers include Ms Margaret Ng, Mr John Yong, Mr. Liu Ban Hong and Mr. Tan Chin Ho. He also attended master classes under Prof. Uros Dojcinocvic, Prof. Josep Henriquez, Prof. Jose Maria in guitar and Professor Yamamoto in composition. After graduating, he began his guitar teaching career as an instructor in MIA. Since then, he has actively performed for various occasions in hotels and restaurants. Apart from that, he has also organized concerts, recitals, music workshops and has led many guitar ensembles. 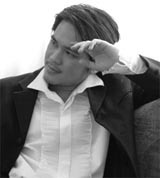 He is currently actively performing and teaching Classical Guitar at the Allegro Music School in Kuala Lumpur. This is something that he won't brag about, but Stanley is one of the rare musicians who actually plays on an instrument that he has designed and built himself! Ask him about it, maybe he'll build you a guitar, too! Visit the Allegro Music Website for more information about one of the music schools where Stanley gives classes.